GeoPilot II PLUS is faster than ever thanks to the new 300 MHz processor, more compact and practical with the built-in battery and GPS receiver, and an extra serial port available for connection with PC and autopilot devices. The Geopilot II PLUS, the new portable aeronautical navigator developed by AvMap, is high performance but truly affordable. GeoPilot II PLUS is faster than ever thanks to the new 300 MHz processor, more compact and practical with the built-in battery and GPS receiver, and an extra serial port available for connection with PC and autopilot devices. 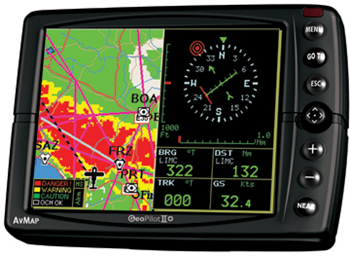 AvMap GeoPilot II PLUS displays all the information you need on a wide 5” color LCD. The display is sunlight-viewable and equipped with a sensor for automatic brightness control and an audio video input. The information is clearly visible and the map page is fully customizable. With an optional antenna you can receive constantly updated XM/WX weather conditions: NEXRAD (next generation radar), and Lightning information are displayed on the map. Enhanced Situational Awareness With the TAWS, GeoPilot II PLUS displays your position in relation to surrounding terrain. With the new Crossed Airspace Predictor function, you can get a preview of the airspaces that you will cross along your flight, while the Crossed Airspace Advisor provides warnings during the flight on airspaces being crossed. Multifunctional: Navigate by Sky and Land! AvMap GeoPilot II PLUS is engineered for aeronautical as well as terrestrial use as it can fit perfectly in your aircraft and in you car. With the 2GB SD Card preloaded with Tele Atlas Maps of North America GeoPilot II PLUS converts into an advanced car navigator with turn-by-turn vocal instructions! SD included at no extra costs!